There’s just a few finishing touches to put in place before the show doors are opened. 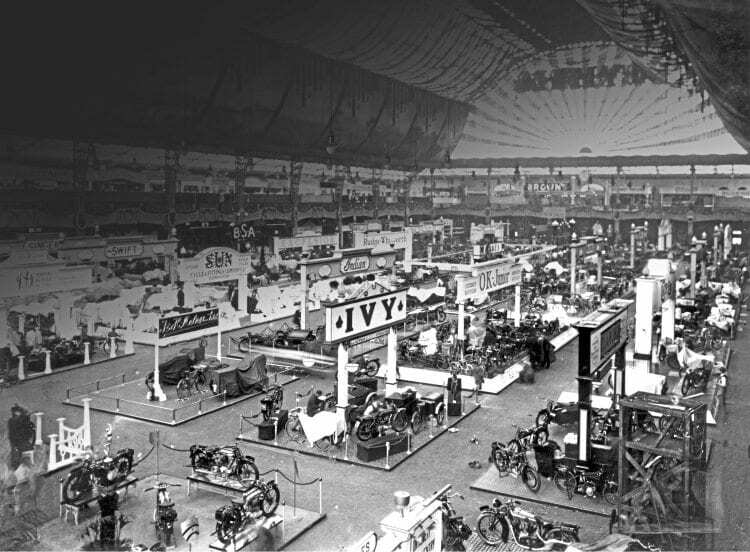 The stands are set, the motorcycles in place, the placards up, and there’s a fair few potted plants in position on the Norton stand in the foreground on the left too, as the final finishing touches are applied here and there before the hordes descend on 1924’s motorcycle show at London Olympia. Norton’s display (front left) is easy to make out; the silver and black machines surround the Senior TT trophy, awarded in 1924 to the Bracebridge Street concern’s Alec Bennett, for victory in the Senior race, on a pushrod 500cc machine, though it could also perhaps be George Tucker’s trophy for winning the sidecar TT, on the 588cc ohv works Norton. The two most prominent machines on display from this angle are both side-valves, the one at the back sporting Norton’s new internal expanding rear brake, with the one front right still having the old-type dummy belt rim rear. Behind the trophy is what would seem to be a Model 18, the tell-tale being its exhaust on the left-hand side. The Norton stand was expecting to be swamped over the course of the show, with many an enthusiast, young and old, dreaming of being able to hand over the £80 required for the state-of-the-art sportster, essentially a replica of Bennett’s TT winner. Read more in March’s issue of TCM –out now!